When I was pregnant with my first child, one of my biggest hesitations about becoming a new parent, was the thought of changing countless dirty diapers and of toilet training. I often wondered if there was a more natural process. I wondered what ancient people would have done! 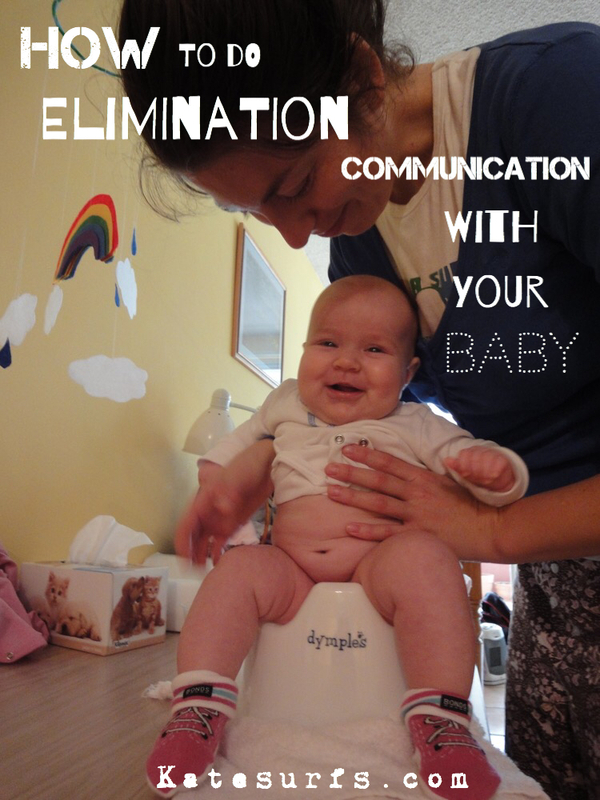 Luckily, just a few weeks before my daughter was born, a lady told me about elimination communication (EC). A lightbulb went off after our brief conversation and I knew that elimination communication was something that I wanted to try. I’ve practiced EC with both of my children and they were both and toilet trained, day and night, right around the time they started to walk. Elimination Communication (EC) is simply responding to the elimination needs of your child. In other words, taking a child to a designated place to relieve themselves, other than in a diaper, when they have to go. Ancient people practiced EC and possibly even your grandmother did it to save on washing cloth diapers. Also, women today, in developing countries, where no diapers are available, would practice EC, out of necessity. While practicing EC may lend itself to early toilet training, the ultimate goal of EC is not just about the end result. Responding to a child’s elimination needs is about opening a two way communication pathway between a care giver and a child, long before that child can speak. Newborns, infants and toddlers develop extremely quickly, so the communication pattern between the carer and their child changes rapidly. Parents can easily learn to respond to their child’s changing communication by observing the child and watching or listening for cues. Similarly, the child learns that his or her elimination needs will be met by a trusted adult carer. Familiarising a child from an early age with normal bodily functions, like urination and defecation, can lead to more heighten body awareness and more confidence. EC can be practiced ‘part time’, meaning that the baby wears diapers sometimes or most of the time, but is given many potty opportunities. EC can also be practiced ‘full time’, in which the child goes completely diaper-free. Whether you choose to do very part time EC or full time EC, you and your child will still benefit. There are many benefits of practicing EC with your child. Here are a few of the main ideas to consider. -Gives baby more diaper free time, which not only is more comfortable for baby, but also helps to facilitate more comfort and ease in reaching physical development in milestones such as rolling, crawling, walking, etc. How Do you Take a Newborn to the Toilet? Obviously, newborns don’t sit and they don’t have much head control. The best way to take a newborn to relieve themselves is by holding them in a squat position, with your hands under their knees, and their back and head resting against your chest or in the crook of your arm. This squatting position helps tremendously with a baby’s delicate digestive system and can relieve a considerable amount of gas and pressure. (A squat position is actually the recommended to ALL people, as the position for relieving one’s self.) Hold your baby over some sort of receptacle, like a bucket, potty, toilet, sink or even the garden, if you’re outside. They even make specific EC potties for infants, called top hats. Whatever you end up using, be mindful of your back, and make sure that you’re not standing at an awkward angle when taking your baby to the loo. Best Age to Start EC? Babies and toddlers of any age can benefit from having their elimination needs responded to. Starting EC with a newborn can be much easier in the long run and very rewarding to all those involved. I can remember countless times when my newborns were unexplainably fussy and a quick trip to the bucket was all that was needed to make them happy again. Most newborn babies will signal very well when they need to eliminate and will start giving signs that they need to go almost immediately after birth. If you’re really lucky, you might even be able to catch that sticky meconium (although I never managed to do that). When starting EC with a newborn, it’s important to take into consideration your own physical condition. If you are recovering from a difficult delivery or had a caesarian, be cautious in those first few days, weeks or months and listen to your body carefully. You can start off very part time and gradually work your way up as you start to feel stronger. The Big Question: How Do You Know When They Need to Go? -when you feel them ‘pushing’ and making a funny face (although sometimes that means you may have already missed most of it). A baby will often arch her back or try to straighten her legs when she is finished eliminating, or if she doesn’t have to go. Many parents who practice EC, like to make a quiet ‘psss’ sound when they notice that their child is urinating. Even if they don’t catch it in time, making the ‘psss’ sound will help the child associate the elimination with the sound. That way, the next time you hold your baby out to eliminate, if you make the ‘psss’ sound, the child will associate the sound with the action of doing a pee. For example, when I was first getting used to doing EC with my older daughter, I would often miss a pee while I was changing her diaper. I would still make the ‘psss’ sound, even though I had missed the pee. I learned very quickly to offer the bucket every time I did a diaper change so that I could save myself from dirtying a diaper. It is extremely common for newborns to eliminate while having a diaper change. Even at such a young age, babies do not like to soil themselves and will often hold it until their diaper is off. You can also blow raspberries as the sound for doing a poo. When my daughter was only three months old, she would blow a raspberry when she needed me to take her! While you can make the ‘psss’ sounds and blow raspberries, you certainly don’t have to. With my younger daughter, I hardly ever made the noises. Just holding her in the classic EC squat position was sufficient communication enough to let her know that it was time to go. If they truly have to go and they are given the opportunity, newborns will almost always make use of a potty opportunity (and newborns go so frequently that it’s almost likely something will come out if you hold them in a squat position). Simply observing your child and their body language (fussing, squirming) can tell you a lot about their elimination needs. Also, patterns, like time of day, or particularly after or during feeds. It’s very common for newborns to have to eliminate mid-feed. I would sometimes breastfeed my newborns with a terry towel wrapped around their bottom, if I had a sneaking suspicion that they had to go. They would often a pause for a second and do a sort of ‘half push’, so I would stop the feed for a second, offer the potty and then keep feeding. Some women don’t even stop the feed, they feed AND take their babies to the loo! Sometimes a frequently waking or squirming baby at night is a sign that they have to eliminate. You can certainly practice EC at night and your baby may sleep much better because of it. I often found that I had to change a diaper anyway at night, so it was almost easier and faster to take my babies to the bucket. Babies who are started on nighttime EC right from the newborn weeks, are less disrupted by EC when they get a little bit older. My girls were so used to me taking them to the potty at night, that they would quite often sleep right through me it! Many mothers keep a potty or bucket right next to where the baby is sleeping so that they can easily feed and EC their babies with minimal disturbance. The benefit of doing nighttime EC is that babies will often start to stay dry through the night at a very young age. Observing your child is the key to successful EC. Often after even just a day or two of careful observation, you will start to get the hang of when they are about to go. It’s not always possible to watch the subtle cues of a child one hundred percent of the time. Especially if you’re learning EC and you have other children to tend to. But, it doesn’t take long to get on track. If you’re having trouble knowing when to take your baby, the first thing to try is by placing them on some sort of a mat or towel without their nappy on. You can even do this on their change table, if you have one. Give them some undivided attention (as much as you can) until they eliminate. Watch for signs that preclude the elimination, which may include, kicking, grunting, and different facial expressions. It is true that newborns eliminate frequently, but sometimes we, as parents, can get a little bit too enthusiastic and start offering the potty too much! Try to find a balance. By not offering too much, you may end up missing something here and there, but you will find that babies can hold their bladders and bowels for much longer than we give them credit for. Newborn babies will cue, verbally and physically, when they have to go. However, if their elimination needs are not met early on, they will often stop giving as many signals that they have to go and may stop showing signs all together. It then will require a little extra observation on the parent’s behalf to get things going again. Interestingly, Dunstan’s baby language states that when a newborn baby has gas, he or she will make a ‘eairh’ sound (along with many other communication sounds). Dunstan also states that a baby will stop making this sounds at around 3 months of age, if the sounds do not elicit a response from the caregivers. They may be too tense or frustrated or overstimulated. When babies get frustrated, it may benefit them to be allowed to cry, in a loving an supportive environment (never alone in another room). If a baby resists every time they are taken to go to the toilet, it could very well be a sign that they have too much stress and tension built up and would benefit from a release of emotions in the form of a supported cry. Imagine how frustrating it must be to be a baby, you would want to cry too sometimes and have someone caring to listen to you. You can read more on that here. The most important part about EC is to remember that it’s just another way to respond to your child’s needs. While catching poos and pees can be money saving, clean and rewarding in the long term, it’s best to keep a calm and relaxed approach to the whole thing. Embrace a little mess and remember to have lots of fun with your baby! Posted in Baby, Cloth Diapers, Elimination Communication and tagged do babies need diapers, do babies need nappies, how to do elimination communication with your baby, infant hygiene, what did people do before diapers. Bookmark the permalink. Hi! I’m sorry this question has nothing to do with your post, but I’ve been following your blog for a while and since I’m pregnant with my second child I wanted to see what you thought about the subject of scheduled nursing after birth. I had my first baby in a hospital and knew of some practices that could be debated (immediate bath for baby, etc) so I had the epidural but wasn’t induced even though I was overdue, we did skin to skin, I nursed him within the first hour.. But waking him up on a three hour schedule seemed unnatural to me. I know that you need to nurse often to produce and adequate amount of milk, but how important is it during the first 24 hours after birth (after the initial feeding when they are visibly hungry)? Just curious about how you did things with your girls. I ended up nursing exclusively for 8 months until we started solid food and continued to nurse to sleep until he was ready to wean, so I know that producing milk in general isn’t a problem for me. I just felt somewhat cruel waking him up all night after I gave birth because he obviously just wanted to sleep off his exhaustion. I’m not even sure if this topic is up for debate (hospitals love schedules) but I want to be prepared this time. Hi! Well… I think this is a tricky subject because the first 24 hours people, especially people in hospitals, really want to monitor a baby and make sure that they aren’t getting jaundiced, etc. (although all babies get it a little). 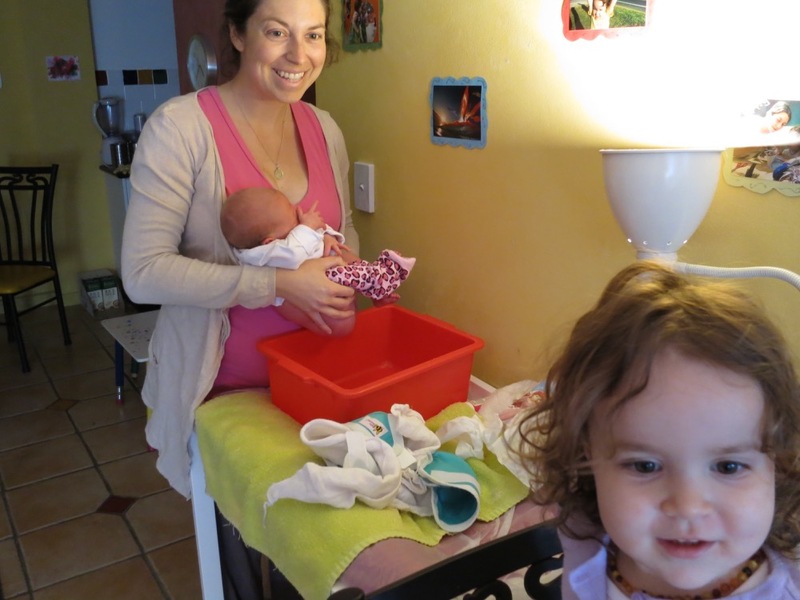 When my second daughter was born at home, the midwife wasn’t concerned if she didn’t have a big feed because her first feed at an hour old, was fairly big. I’m not a lactation consultant or a medical professional, and that first day or two is when they look for problems, so I can’t really say. I know it seems mean, but I think it is important to rouse them a little to make them feed. After the first few days, and once the feeding is established and they are all clear, I would say no need to wake them though.